Jenny Moews is having her BOOK PARTY EVENT TODAY ON FACEBOOK! YOU'LL NOT WANT TO MISS IT! Read the synopsis, first chapter and author's bio! Dylan has worked hard to rebuild her life in the sleepy little town of Heaven, Oklahoma, despite the haunting of her recent painful divorce. She has chosen the town of Heaven as the place to begin her search for her birth mother. All she knows of her mother is that she was Amish and she had once lived in the area. Someone in Heaven knows the secret surrounding Dylan’s birth. Dylan left an exhilarating career as a sous chef in a five-star hotel to work in Hannah's Bakery, and just when she starts to get settled into her new life, her ex-husband comes into town and threatens her and everyone she has come to care about. An Amish man with his own dark past comes to Dylan's aid and soon finds himself facing murder charges. Peter has two motherless children to care for in an Amish Community that is ready to shun him forever. To make matters worse, in the eyes of the church, Peter is still married to a murderous woman on the run. Dylan flees to escape the men after her ex-husband and lands right in Peter's lap. Peter has no choice but to hide Dylan within his Amish family. The very lives of the people they love and care about hinge on the edge of disaster as Peter and Dylan try to navigate a forbidden attraction that sparks between them. Dylan and Peter face many challenges. Each trying to survive with past connections and mistakes along with a whole community of people who try to come between them to keep them apart, despite the growing love they both feel for each other. The end is a thrilling conclusion to a rollercoaster of events. Dylan and Peter both face their past, conquer their fears, make peace, and find a way to blend their lives together to form a solid family with a fresh start. Sally Beaufort stared out the window of the cabin she and Jess were currently holed up in. Her long dark hair fell down her back, and with her big brown eyes bathed in the moonlight, she looked angelic with an innocence that belied the cold blooded killer she really was. Outside, the snow fell while worry and fear filled her thoughts. Why don’t they come? I’m so sick of waiting and waiting. They should have come by now. The cabin was more of a shack, really used only for occasional hunters nestled far up in the Appalachian Mountains of Ohio. There was only a wood burning stove for heating and cooking and no running water or electricity. Jess’ cousins promised to bring food and to find an Amish community willing to take in strangers. For that to happen they would need new identities. Sally would have to make herself Amish all over again The mere thought of spending even one more day in Amish trappings angered her to the point of becoming irrational. The gold she’d so patiently waited for was now lost to her. Jess slept, snoring softly on the narrow cot in a corner of the one room shanty. For her, Jess was the only connection to protection she had at the moment. Jess was her ticket back into the Amish world. He was good looking enough, but it wasn’t love between them. Jess was now a means to an end for her. It never occurred to her that Jess had lost many things as well and had also done murder. 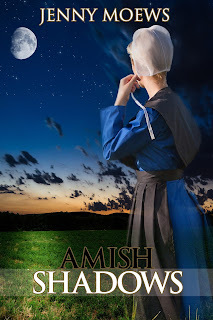 It was Jess’ connection to the Amish that kept them together now. Jess had grown up Amish and could speak Pennsylvania Dutch well. These past weeks, with nothing better to do, he had been teaching the language to her. Sally was smart and was picking it up quickly. She continued to watch the falling snow outside the window and heaved a lingering sigh. Surely they will come soon. She pulled the old quilt she had wrapped around her shoulders a little tighter. It was going to be another long cold night. After putting some more wood in the stove, she went to join Jess on the cot. At least it would be warm lying next to him. In the moments before sleep took her, she thought briefly of Peter and her two young boys. As soon as I know where were going, my sweet babies, I will come for you. Standing in front of a dressing mirror, Hannah swished the skirts of her silk off white wedding dress and smoothed her floor length lace veil with her nervous fingers. Never in her wildest dreams did she ever think she would own a dress so beautiful, much less wear it. She had come a long way in the last few weeks since she had agreed to marry Quinn. Gone were the grays and blacks that had been her everyday apparel since her childhood. She wore her long hair down her back in soft honey colored waves. Just the way Quinn liked it. Today was the first day of a new life for her and her children. Hannah made her choice, and she never looked back. She had promised to live a life without regret, and was determined to keep that promise for herself, her children, and Quinn. It seemed very appropriate to Hannah that she would start this first day of the New Year with a wedding to step into a new life. The strains of organ music began to play, so Dylan hugged her friend tightly and slipped a small blue bead into Hannah’s hand. “This bead is off my dress. So now you have something borrowed and something blue.” As the music continued to play, Dylan left Hannah to find her seat among the pews. Hannah thought about how different this wedding was from her first one. Her dress had been a simple dark blue with a black apron and bonnet hand sewn by her mother and herself. There was no something borrowed or blue, no organ music, and no flowers. A simple hand fasting and exchange of vows comprised the entire ceremony. The wedding cake was plain yet elegantly handcrafted by her mother. The dinner afterwards had been well attended by the entire Amish community. There were no more than a handful of people in the church today, but Hannah could not have been happier. She promised herself again to embrace this new life and all its strange elaborate traditions joyfully. Outside the church, the snow drifted down in fat icy flakes. The air was crisp and cold, but Hannah’s heart was warm as she stepped up to the doors leading into the sanctuary. Timothy, her eleven-year-old son, stepped up beside her to take her arm. He was dressed in a new black suit with a yellow tie to match the yellow daisies in Hannah’s bouquet. Ruth Anne, his younger sister, stood in front of them. She wore a matching off white plain silk dress with a matching yellow sash and carried a small flower girl basket filled with fragrant yellow rose petals. Her bright red curls surrounded her face completing her angelic appearance. Hannah beamed with pride as she walked down the aisle with her children to meet Quinn at the altar. Quinn was visibly taken with Hannah. She was the most beautiful woman he had ever known inside and out. Nothing he had ever done in his life made more sense than marrying Hannah and promising to care for her and her two children. With his best friend Ollie at his side, he took Hannah by the hand and vowed to love, honor, and cherish her for the rest of his life. Jen Gentry (nee Jenny Moews) is an award winning bestselling Christian writer of fiction and non-fiction works. She writes to entertain and inspire as well as to bring glory to her own personal savior, Jesus Christ. She is a wife, a mother, a grandmother, and a Registered Nurse. Her life journey has not been an easy one. She knows what it means to walk through the fires of faith, as she knows the pain and the joys of life.